In Fun! Fun! 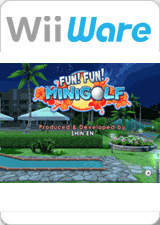 Minigolf, play minigolf with your friends in beautiful environments. Choose a character and turn your Wii Remote controller into a golf club. With its easy-to-use controls, all you need to do is aim, swing, and see who's the best putter. Play 27 holes spread across America, Asia, and Europe. Enjoy exotic locations all over the world. Go for gold in single-player mode, or invite your friends. Fun! Fun! Minigolf supports up to four players. You can use one to four Wii Remote controllers. Fun! Fun! Minigolf is the ultimate party game for everyone. The graph below charts the compatibility with Fun! Fun! Minigolf since Dolphin's 2.0 release, listing revisions only where a compatibility change occurred. This page was last edited on 31 January 2018, at 00:12.